With the flurry of announcements from Apple HQ on Tuesday 4th October with regards to not only new hardware but also new services it may have been easy to miss, what I believe may be the seeding of a whole new customer marketing tool in iMessage. 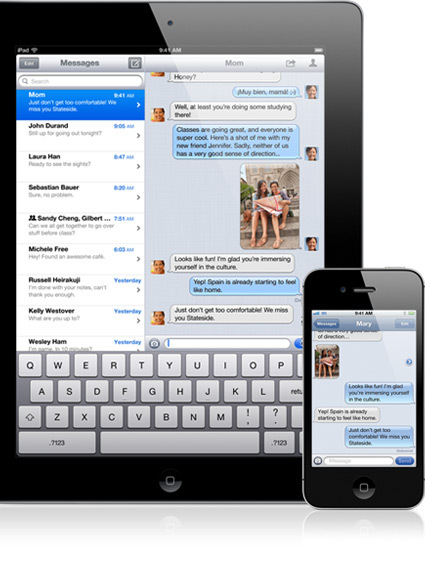 Whilst iMessage is not a new concept, in fact it would look to have been developed on the basis of the runaway success of Blackberry’s Peer to Peer (P2P) messaging service, BBM, it may prove to be a valuable route to reach owners of iPhone, iPod Touch and iPad with not only traditional style text communications, but also image content and even video! BBM proved to be a big driver of adoption of a device, previously the favoured device of the suited executive, by a new much younger demographic despite it’s significant cost. One need look no further than the prominent use of this during the recent riots in London to get an idea as to who is actually making most use of the service. So what is the opportunity for the digital marketer? Well, the emergence of the smartphone has lead to richer media experiences on mobile devices via embedded browsers. The trends, as indicated by eMarketer, would point to the emergence of video as the fastest growing type of mobile advertising with a compound annual growth rate of 69% (or $395.6m) by the end of 2015. With P2P video advertising now a distinct possibility across a variety of iOS devices, marketeers now have an opportunity to harness the benefits of the highly measurable mobile direct response marketing and couple this with richer and more engaging video communications which should drive even better conversion rates on advertising, so long as this is balanced against the cost of the production of correctly rendered and quality video content. For now there is not complete clarity as to whether enterprise level use of iMessage will be permitted in the short term. However, as has been learned from the commercial use of Facetime, there will be undoubtedly be those that can find a way around this potential barrier and with Apple determined to grab even greater market share, beyond the current 5% share of global smartphone shipments, over the years to come, and the competitors highly likely to respond with similar offerings this market is destined to grow in value year on year. Certainly, as demonstrated by the research conducted by Mobile Marketing providers Púca, certain markets, such as Ireland, where Apple’s share of the handset market is already greater than 15%, there is no shortage of test markets in which to prove the concept.